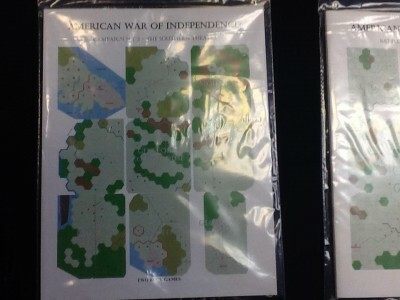 Gettysburg Wargamer Bill Molyneaux has designed several new board games recently, including a series of easy-to-learn American War of Independence (AWI) games which are now available at Gettysburg Miniature Soldiers and other outlets. Click here for more information. The AWI Campaign sets share a common rule set with battle specific changes so it is easy to learn. 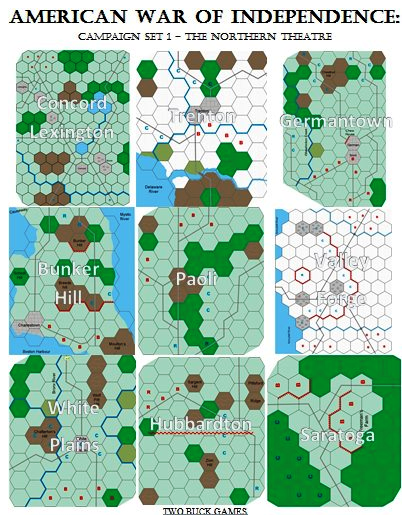 Most of the 9 battles can be finished in under 2 hours regardless of your wargaming experience. Experienced players will comfortably finish most battles in under an hour. Bunker Hill – 17 June 1775. White Plains – 28 October 1776. Trenton – 25 December 1776. Paoli – 21 September 1777. Hubbardton – 7 July 1777. Germantown – 4 October 1777. Saratoga (Freemans Farm and Beamis Heights combined). American patriot. Lawyer. Politician. Third Vice President of the United States. Killer of Alexander Hamilton. Traitor. There are many labels to which Aaron Burr has been called throughout history. Despite these many labels, there have been relatively few books on Burr’s life which have been comprehensively written and attempted to solve the mysteries surrounding him, until now. 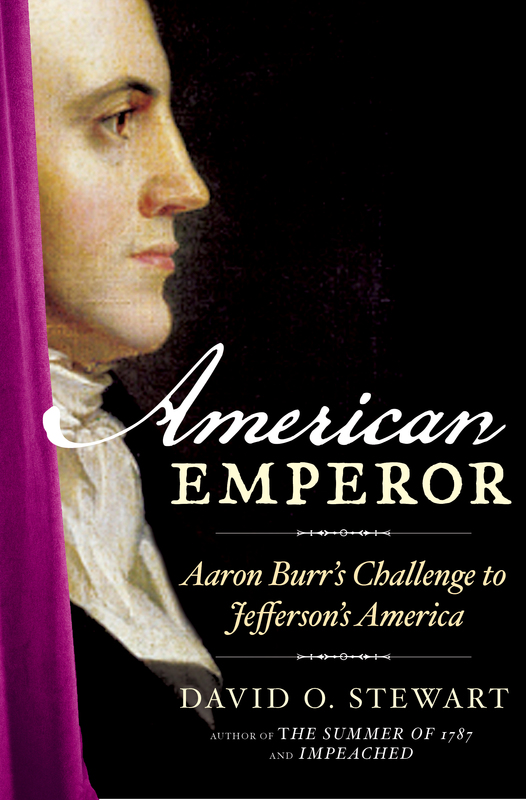 Controversial American forefather Aaron Burr’s life is wonderfully dissected by highly acclaimed author David O. Stewart in his new book American Emperor: Aaron Burr’s Challenge to Jefferson’s America. Finally, historians and readers alike can get a better understanding on the polarizing Burr, his life, and his tragic fall from political stardom, wealth, sterling reputation. 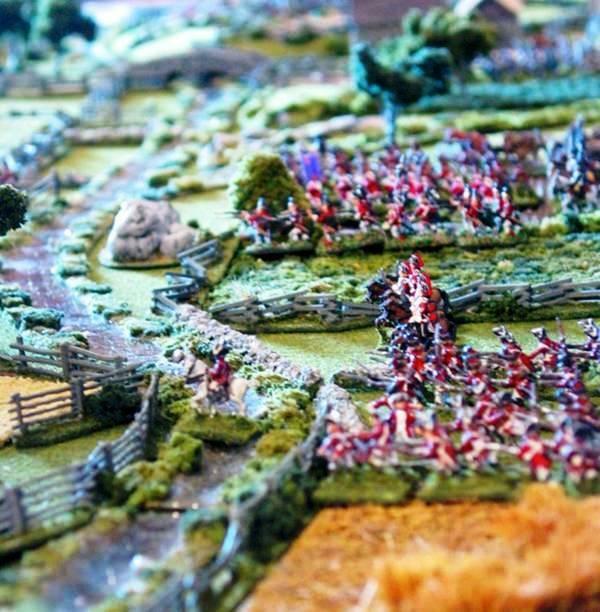 10mm AWI mini-diorama from Andy Mac! British wargamer and master painter Andrew MacDonald-Rice is off for the Triples wargaming convention. However, he sent me some photographs of a custom-made diorama he constructed for display at the Pendraken booth (the makers of these nicely sculpted tiny warriors). As usual, Andy Mac has paid meticulous attention to the proper attire for the wee lads, and his painting skills for 10mm take a back seat to no one. I am sure this display will be well received at the convention! Thanks Andy for sharing your handiwork with your fellow members of JRGS. Some beautiful 10mm figures from Andy Mac!!! Check these out for some sweet-looking figures!!! 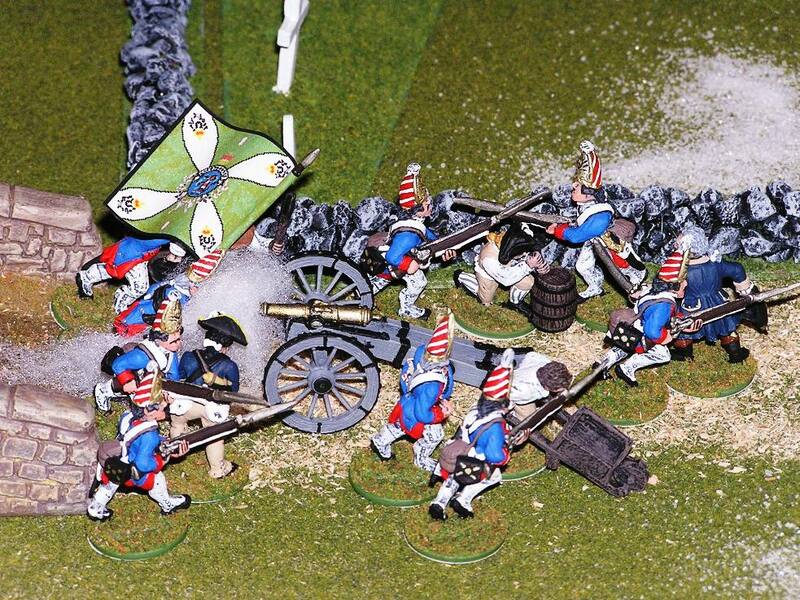 Andy Mac is back with more of his meticulously painted miniature wargaming figures, including 10mm American War of Independence (AWI)! Click HERE to view his photobucket slideshow! This 54mm vignette of the American Revolution graces John Zabawa‘s Gettysburg Miniature Soldiers in Gettysburg, Pennsylvania. A while back, I posted several photos of my 15mm AWI figures (and recently posted pix of Stephen Huckaby’s and Eric Kessler’s 25mm AWI game). I have long held an interest in the American Revolution because one of my ancestors participated on the American side. My sixth-great-grandfather, Moses Mingus, was a resident of Montgomery in Orange County, New York. He enlisted in the army on March 30, 1777, and served until the spring of 1783. He was in Captain James Black’s Company in Colonel William Malcom’s regiment. This was one of sixteen regiments in the Continential Army officered by General George Washington, but it did not actually belong to the Line of any particular State. It was credited to New York. Charge! readers and Erie, Pennsylvania, wargamers Eric Kessler and Stephen Huckaby sent me some very nice photos of a 25mm AWI game using a scenario for the Second Battle of Trenton (also known as the Battle of the Assunpink Creek, which took place on January 2, 1777). I believe they used Brother Against Brother as the rules. Trenton, a once peaceful colonial New Jersey town, is rattled a second time in the American Revolution by the discordant sounds of warfare as combatants maneuver for advantage. American advance forces significantly delayed Lord Cornwallis’s forces before slipping across the creek to prepared defensive positions. Stephen Huckaby is an Erie, Pennsylvania, wargamer that I was fortunate to know when I lived in northeastern Ohio. He helps organize and coordinate the periodic Erie “Day of Gaming” regional mini-conventions. Here is a photo of some of his 25mm figures in action. The first are Foundry 25mm Confederates painted by Stephen. This is a Brother Against Brother engagement… using a non-historical scenario. It was a pick-up game to introduce his brother (who was visiting from Georgia) to miniature gaming. 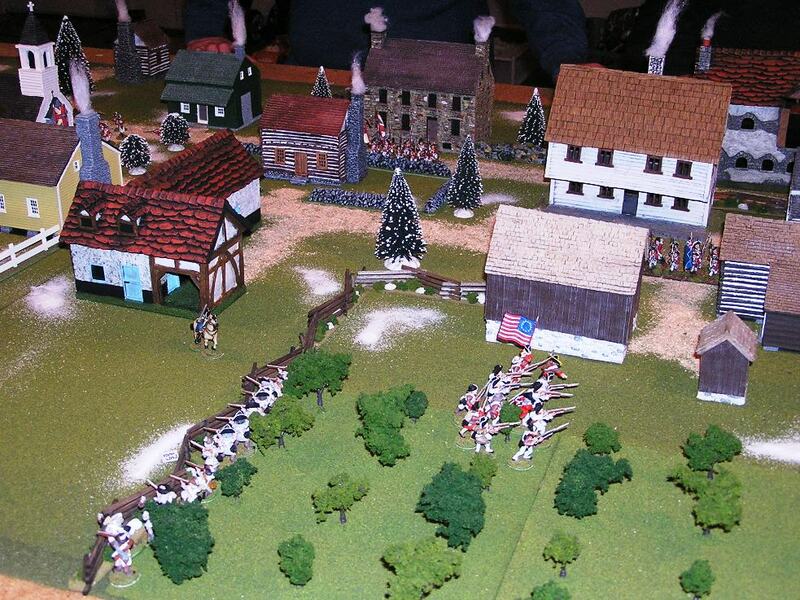 Some of you have asked for a few more photographs of my 15mm American Revolution games. Here are some more, as taken by Tom Poston at a past Cold Wars gaming convention in Lancaster, Pennsylvania (the heart of Pennsylvania Dutch and Amish county). Click on the four photos to enlarge them for better detail.